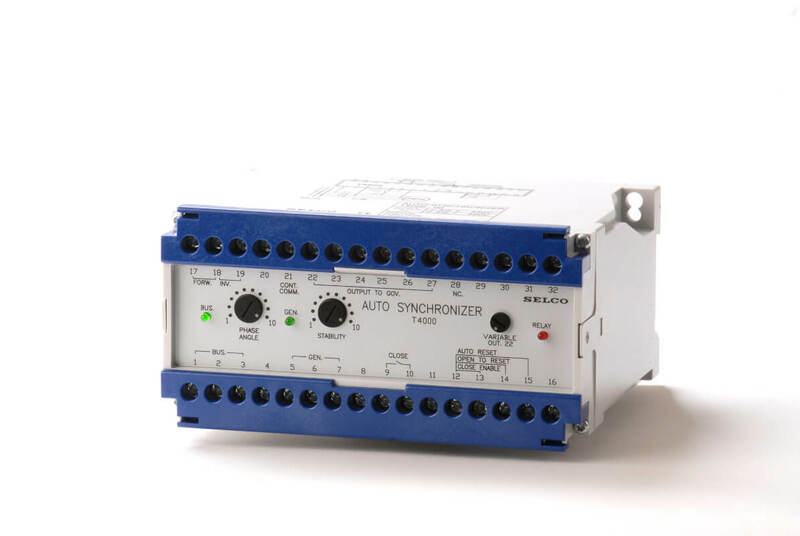 The Auto Synchronizer T4000 for Electronic Speed Controller T4000 provides automatic synchronization of an incoming generator to a busbar in a minimum of time. The SELCO T4000 Auto-Synchroniser provides automatic synchronisation and connection of a generator to a live bus bar. The T4000 measures the voltage across two phases on either side of the circuit breaker in order to obtain data on frequency, phase and voltage deviation. The T4000 will automatically adjust the speed of the generator (through the speed controller) in order to match the frequency and phase to the live busbar. The speed output signal is a variable DC voltage, which can be easily matched to the speed trim input of an electronic speed controller. The magnitude of the output voltage is proportional to the frequency/phase deviation. When used together with the T4300 Load Sharer or T4400 Load Sharer, the speed output must be passed through the T4300 or T4400.